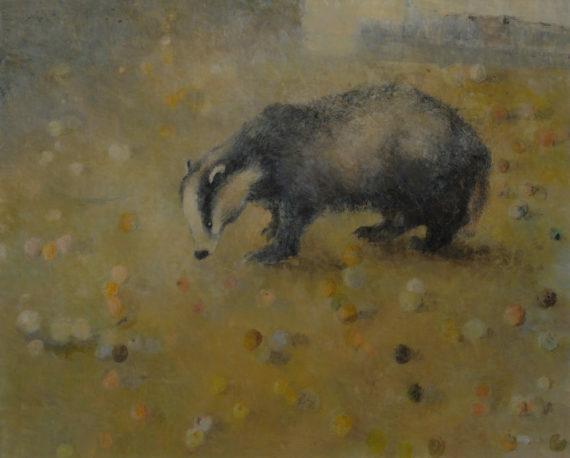 'Country Dwellers' is a solo exhibition of paintings by Anna Dickerson at Jane Newbery. Hares, garden birds and badgers are painted with delicately layered colours, smooth and partly burnished. This beautiful exhibition brings a glimpse of the countryside to London. ‘Country Dwellers’ is a solo exhibition of paintings by Anna Dickerson at Jane Newbery. Hares, garden birds and badgers are painted with delicately layered colours, smooth and partly burnished. This beautiful exhibition brings a glimpse of the countryside to London. Biography: Anna Dickerson graduated from Glasgow School of Art and Rhode Island School of Design in 1995. She worked full time at her London studio until 2014 when she moved to Kent. Anna was Artist in Residence at the London Zoo from 2009-2010 where she had a solo exhibition. Anna features in a documentary produced by the Tate Gallery, drawing live on film at the London Zoo. She has work held in collections worldwide including the United Nations Art Collection at FAO, Rome.